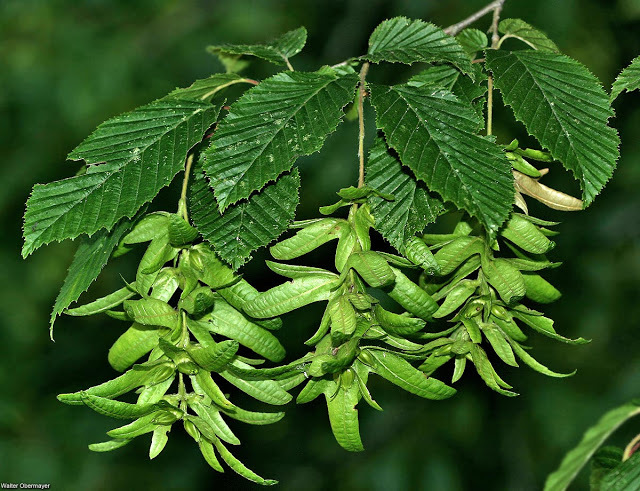 Carpinus betulus is a small tree to 20 m tall, habit tree-like, young bark gray-brown, smooth, lenticels prominent, bark on trunk gray, trunk corded, winter buds appressed to stems, curved inward, 0.5 cm long. Leaves alternate, to 12 cm long, 5 cm wide, egg-shaped, tip pointed, base rounded to slightly lobed, margin doubly, sharply toothed, veins more deeply impressed than those of C. caroliniana, and retains leaves longer in fall. 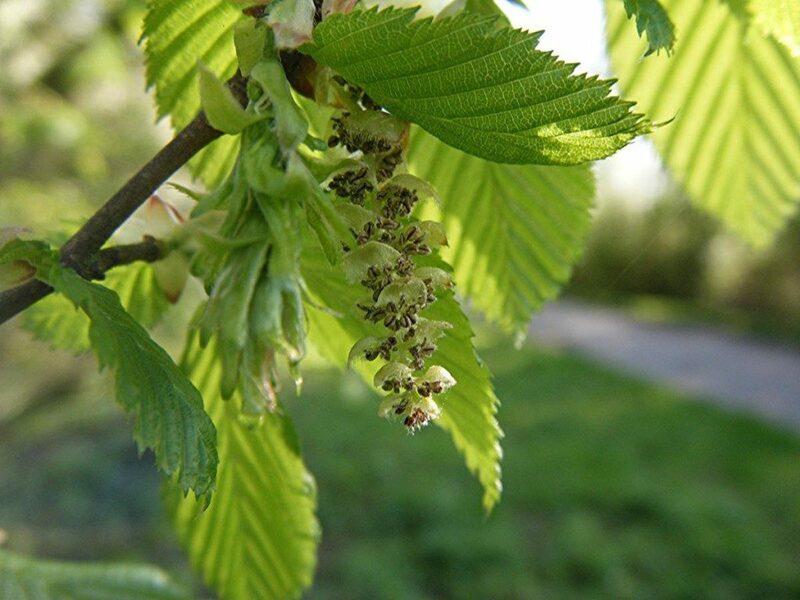 Carpinus betulus (European hornbeam) male and female inflorescences. Leafland. www.leafland.co.nz (Accessed 12/2017). Flowers monoecious, in catkins, no sepals or petals, staminate (male) flowers each with several stamens in a bract; pistillate flowers with two flowers per bract ; blooms April. Fruit in elongated catkins 7-14 cm, each subtended by a large 3-lobed bract, 3-5 cm long, middle lobe narrowly egg-shaped, often toothed, veins 3-5.